Is this a bogus article or what? Unfortunately, the Stinger isn't doing so well. Apart from Australia where it's been surprisingly well received, it hasn't quite seen the levels of success Kia hoped for within North America. Europe has also pushed heavily for the Stinger, although being a market that has its own strong offerings in the very segment the Stinger is supposed to fight in, it can be a little difficult to remain competitive. 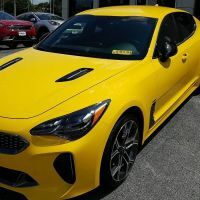 It was something that Kia took a big chance on, and unfortunately it isn't going as well as planned, and according to Australia's Which Car, plans for the next generation Stinger is in doubt. It's this simple fact that is causing Kia to reconsider producing a successor to the current Stinger. The car was popular among critics and garnered a lot of interest from the public, but poor sales means it does not present an appealing enough business case to the Korean brand. On the one hand, they are continuing their marketing push in Europe, but on the other they also feel that the project is a dead end and won't be profitable, despite appealing to a select group of enthusiast drivers. Personally I doubt that Kia's strategy for the Stinger was ever to be a high volume seller. It's meant to be a halo car that helps them sell more Optimas and other cars. I suspect they would at least wait to see if it does that before making any decisions. But also, they know from Hyundai, that Hyundai wasn't really successful with the Hyundai Genesis until they changed the brand name entirely to Genesis. So I wonder if that wouldn't hold true here too, or if they don't just roll the Stinger into the Genesis brand. Not so sure about that......the dealership I got mine from can't even keep GTs on the lot. That article is complete hog wash. They have ZERO credible sources from which they gathered their information. I can personally tell you that I know that they hoped for more but doesn't everyone??? LOL We hope for more from a marriage, our employers, our kids, and even McDonalds! The truth is that no one would even consider pulling the plug on a vehicle 10 months into it's existence. "Speaking to Australian media at the Paris motor show, Kia's head of design Gregory Guilliame acknowledged the Stinger's achievements as a brand ambassador, but cautiously admitted a second generation of the stylish four-door coupe will only happen if it is a widespread sales success." I sort of believe it, though, as my current and ongoing experience with a Kia dealership tells me the brand is not ready for the car. When does the typical car have a 'second generation'? Isn't that around the 4 year mark, give or take? Stinger's been out for less than a year, I think? A little premature to start digging a grave already, in my opinion. Here's your perspective; the Sedona sells around the same number of units as the Stinger and it's still holding in the lineup. The Cadenza only sells 30% of the Stinger and isn't going anywhere. Even the K900, at a measly 2% (only 260 YTD), is just getting another model redesign. It makes no sense that they would scrap the Stinger with all of the attention that it's receiving AND with the way this car is reshaping the brand image. Trust me, the Stinger is here to stay. Now, regarding your poor experience with your local Kia dealership, I'm sorry. It sounds to me like a dealership with low standards is confusing perception of Kia corporate. Many dealerships have poor customer service standards. This spreads across all brands. What you'll see below is that MY Kia customers rank us #1 in our district and 26th in the nation out of more than 750 Kia dealers. The bottom line is that a business chooses to be respectful when they realize that their REAL product are their guests.